Both sides play awfully but White definitely outplays Black. Oh, no. I have to say that Black loses points with every move. White 1 should have been at a since that was a sente play threatening to capture three black stones. Then White had to play at 2 to prevent the opponent's sente at the bottom. Black 2 is definitely a mistake showing a lack of technique. How should have Black played here? See next diagram. 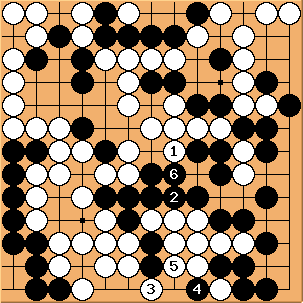 Two stones that Black sacrificed are balanced by two white moves in her own territory, so the score remains the same. Moreover, Black enclosed his territory keeping sente with 7 and this is a gain, especially when White's 7 is sente as well. 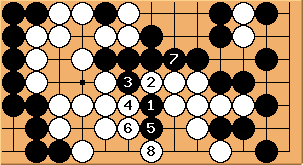 Double sente moves are the largest on the board. However, Black 7 - White 8 is the wrong follow-up. Black should take his sente with Black 1 - White 2 and then tenuki and play the biggest move at 3, leaving the tesuji behind as aji (Next diagram). Then White has a one-point sente play. 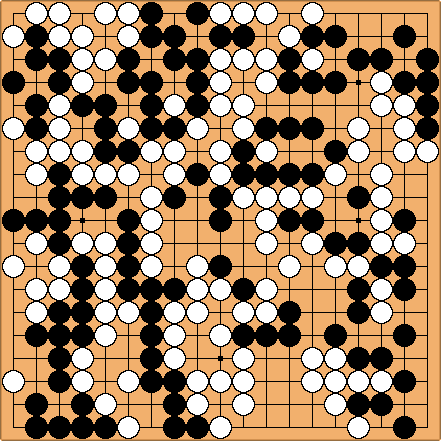 Black 6 is very small, since maximum that White can get there was one point gote. White would not defend the stone under atari since it has very small value. Bill: 2/3 point by miai counting. White 7, Black 8 are small too. There are much more important moves at a and at the bottom. This is the quality of the play of IGS 5k level. Quite bad even taking into account that the game is very fast. Bill: White 7 - Black 8 are miai. 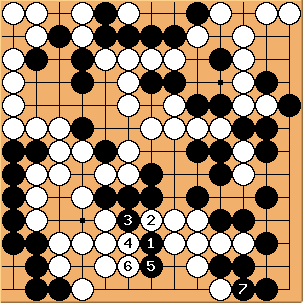 White 7 is worth 0, Black 8 is worth one point. The 9-10 exchange is sente for White giving him one point. White 9 is not the best and could be played later but it is a plausible move. 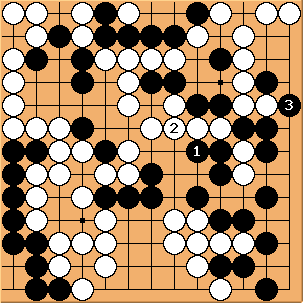 There is no objection to Black's 10. It is important, otherwise a large group would be cut off from the main forces and even if survived, Black would have to waste moves to take one of White's dead groups off the board.